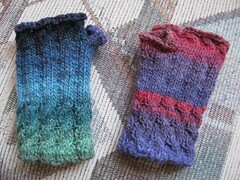 Another pair of Noro fingerless gloves that I made from the same ball of yarn and they look utterly different. *laughs* But they're pretty and warm and thick and should work out nicely for ginnyvos. I do like the color changes, and didn't exactly like or dislike the knot in the middle that made the purple repeat. It was a nice, quick knit, and I enjoyed it a great deal. One amusing thing is that Jet has worn his new socks ever since he got them. I only wash them at night, and then he wears them and wears them every day. The nice thing is that the yarn is so thick that there's no *way* he's going to wear them out. Gah. What am I doing Planning for it? Oh, very nice! How was the fingerless glove pattern to work with? I need to make myself a pair for the office for when summer hits. Yes, summer. Apparently the comfort of the computers is more important than the comfort of the people. I like how the socks turned out. Too bad there's no easy way to see what they would have looked if you'd left the black out of the middle of the colors. That said, I do like the say the foot changes from purple-green stripes to black-green and back again. It was really, really easy, but I cast off right after the cable row so that it wouldn't curl as much at the top. It's nearly enough like stockinette that it has a tendency to curl more if one actually follows all the instructions. I also didn't bother with the picot bind off. Mmm... yeah, I do like the overall color changes quite a lot. I will have to try it again sometime. If *only* I liked the quality of the yarn Knit Picks put in those blanks better. It's their superwash/merino sock yarn, which splits very easily and is rather... thin, I guess I'd call it. It has very little body to it, and while it stretches well, it doesn't feel like it'll hold up all that well. If I didn't know, I'd say the fingerless gloves were made from 2 entirely different balls of yarn *grins*. I like random things like that and the colours are simply gorgeous. I also like the funky pattern on the socks. You know you're going to do that shipwreck shawl *nods*. You mooned over the patter (which is very pretty) and mentioned the beads and now you've picked out appropriate yarn to do it in. I think you're crazy (but in a good way) and I look forward to seeing the finished product. Me, too. 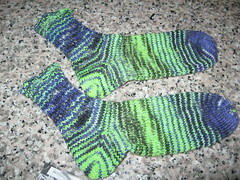 I love that they are kind of random... yay that the sock colors worked, too! I have a hat with pigtail holes and a matching "hug" (connected sleeves) with mitten cuffs and thumb holes that a friend made for herself and gifted to me when they were a tad too small. They're dark orange and mustard wool knit doubled. I love them. Oh those fingerless gloves are totally awesome! Would you be willing to add a pair of those for me to the order of socks for my boys next fall? I absolutely adore the color of those, but any multicolor would be fun. *grins* I think I'm dooooomed... but it would be perfect for summer knitting anyway. Really, I am just doomed to knit it, but it'll be a nice knit when it's too warm outside for doing all the heavier stuff. And Size 4's are better than the size 2's or 3's I used to use on my shawls. I've done Pi shawls, before, and since the outer rings are with the bigger needles it'll go much faster than most things that size. I've made myself a set of utterly ugly fingerless gloves by hacking up a pair of socks. Hey, it works! I love the stripeyness of the socks. Do you want a pair of prettier ones?